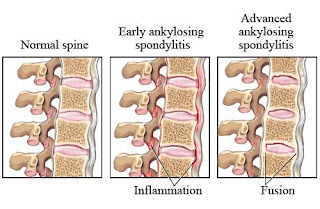 chronic inflammatory disorder of the axial skeleton. strong genetic predisposition associated with HLA B27. traditional treatment begins with physiotherapy,regular use of NSAID's,local corticosteroids injections and sometimes sulphsalazine. surgery has a place in manaement including fusion procedures or wedge lumber osteotomy. TNF inhibitors has revolutionized the management of AS. treatment with TNF inhibitors should be considered for patients with persistantly high disease activity despite conventional tratments. Question:AS is easy to spot in the exam.what are the steps of examination to score 4/4? what question you might want to ask the patient? u know the A disease presentation! !